Many men and women (including me) are dismayed to see hair falling out in clumps, either following childbirth, during or after menopause or due to other causes. Hair plays an important role in most people’s overall appearance. Unfortunately, when we see signs of appearance slipping, we are devastated. As men and women, we have to realize that sometimes these things are out of our control. Hair loss does not imply that we’re ‘slipping’ or ‘aging poorly.’ Instead, hair loss can be caused by a hereditary trait, a hormonal imbalance, stress, a reaction to medication, or a symptom of sickness. Just yesterday, I was able to attend Novuhair's newest event at Tomas Morato. I personally want to attend this event because I have so much in mind since I'm obviously experiencing hair loss. Honestly, I'm really frustrated on how I will grow my hair back. Novuhair now offers the powerful trio combination of shampoo, conditioner and topical scalp lotion in one convenient pack that guarantees to deliver the solution to your hair woes while assuring growth of healthy hair. Novuhair promises to say goodbye to premature hair thinning and restore your confidence with Novuhair 3-in-1 combination pack – truly nature’s answer to hair loss. 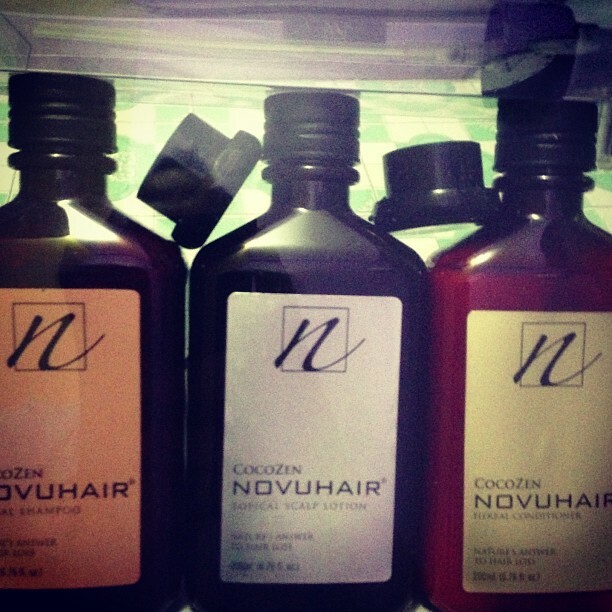 Novuhair products boast of pure botanical extracts and essential oils that are known for centuries to cure hair loss. Novuhair Herbal Shampoo complements the usage of Novuhair Topical Scalp Lotion as it gently cleanses the hair and scalp and frees it from harmful elements.